The terrorist attack on the Crossroads shopping center in St. Cloud, Minnesota by Dahir Adan, a 22-year-old Somali immigrant, was stopped by a man named Jason Falconer. Adan was rampaging through the mall, stabbing people whom he encountered, including a 15-year-old girl. Providentially, Falconer happened to be at the mall and confronted Adan. Security video shows Falconer shooting Adan several times. Adan doesn’t stay down; he repeatedly gets up off the floor and lunges at Falconer with his knife. Finally Falconer fires a fatal shot, or the cumulative effect of the several shots he fired is deadly. 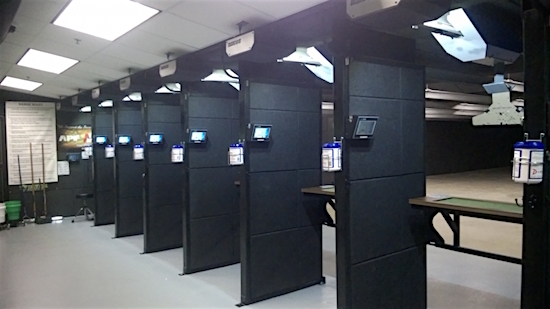 Falconer is the president and owner of Tactical Advantage LLC, a shooting range and tactical training facility with a strong focus on arming concealed carriers. 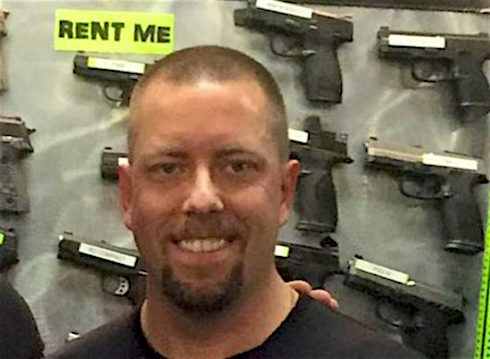 Jason Falconer is one of those licensed to teach Minnesotans who want to apply for a permit to carry handguns. It is almost a miracle that a man so highly qualified was on hand to stop Adan’s bloody rampage before anyone was killed. (ii) the requester or the requester’s agent personally informs the person that guns are prohibited in the premises and demands compliance. (2) “Prominently” means readily visible and within four feet laterally of the entrance with the bottom of the sign at a height of four to six feet above the floor. (3) “Conspicuous” means lettering in black arial typeface at least 1-1/2 inches in height against a bright contrasting background that is at least 187 square inches in area. But the Minnesota law requires such signs to be posted “at every entrance to the establishment,” while my informant says there is “only one there but off to the side, and only one.” And the language on the sign is not quite that prescribed by the law. So maybe Crossroads’ effort to ban guns was ineffective. This is the point I want to stress: under Minnesota law, Mr. Falconer was taking no great risk by bringing his gun into the shopping center, whether the center’s signage was sufficient or not. Our statute provides that if someone disobeys such a sign, the remedy is for the store owner to ask him to leave; if he fails to do so, the maximum fine is $25. 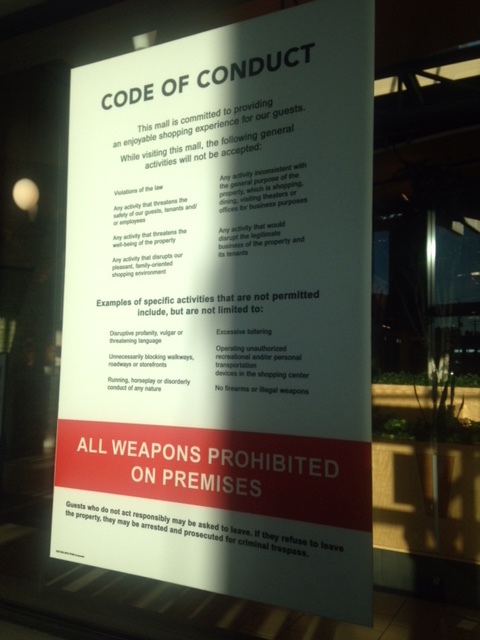 So it is by no means rare for permit holders to carry firearms into places where “no guns allowed” signs are posted. In this case–if that is what happened–it was a life-saving bit of possible illegality. Minnesota’s gun laws are liberal, in the good sense of the word–the result of a “shall issue” statute passed in 2003 by a coalition of Republican and rural Democrat legislators. That liberality has contributed to improved public safety since 2003, and it surely saved the lives or well-being of a number of Minnesotans who would have been attacked by Mr. Adan, had Jason Falconer not been at the mall. And not just at the mall, but armed. So this is one time when “liberal” laws are good. One more thing: a number of states have enacted laws that require handgun or rifle magazines to be of ridiculously small size. Such restrictions have also been the subject of proposed federal legislation. Magazine restrictions are dumb for several reasons, including this one: as in this case, it usually takes several shots to bring down an attacker. Moreover, if an amateur like you or me shoots at a moving target, we will probably miss with most shots. So it doesn’t take a mathematical wizard to understand that six or seven bullets in a magazine will, in many instances, not be enough. The hundreds of people who could have fallen victim to Dahir Adan were fortunate that they live in a state without such silly restrictions, and–no doubt more important–they were lucky that Jason Falconer was an expert marksman. UPDATE: For a slice of reality, watch this brief press conference by the Chief of Police in Avon, Minnesota, where Jason Falconer worked on a very part-time basis–he was not scheduled to work in the next two months. The chief, a longstanding friend of Mr. Falconer, makes a point that my wife emphasized to me: Falconer is distraught, and has declined interviews. No sane person wakes up in the morning and says, This is a great day to shoot someone! Not even a terrorist. Mr. Falconer, in a relatively small way, is a victim of Dahir Adan, too.